Dynamic radar cruise control supplements conventional cruise control with a vehicle-to-vehicle distance control. In vehicle-to-vehicle distance control mode, the vehicle automatically accelerates or decelerates in order to maintain a set following distance from vehicles ahead. 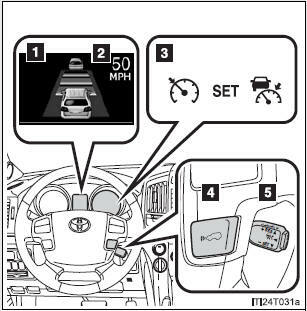 Press the “ON-OFF” button to activate the cruise control. 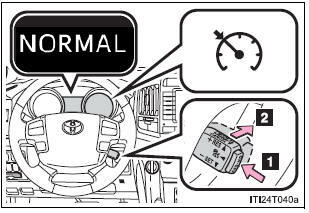 Dynamic radar cruise control indicator will come on. “SET” indicator will come on. The vehicle-to-vehicle distance is set automatically to long mode when the “ENGINE START STOP” switch is turned to IGNITION ON mode. When your vehicle is too close to a vehicle ahead, and sufficient automatic deceleration via the cruise control is not possible, the display will flash and the buzzer will sound to alert the driver. 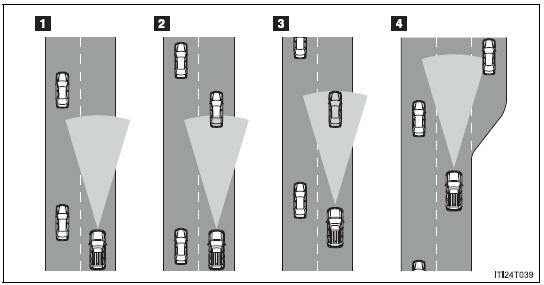 An example of this would be if another driver cuts in front of you while you are following a vehicle. Apply the brakes to ensure appropriate vehicleto- vehicle distance. 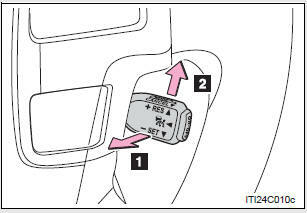 If the “ENGINE START STOP” switch is turned off and then turned to IGNITION ON mode again, the vehicle will automatically return to vehicleto- vehicle distance control mode. 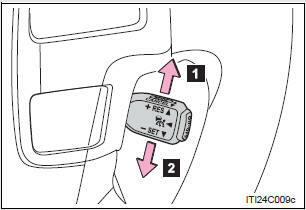 The shift lever is in “D” or range “4” or higher of “S” has been selected. The vehicle can accelerate normally. After acceleration, the set speed resumes. However, during vehicle-to-vehicle distance control mode, the vehicle speed may decrease below the set speed in order to maintain the distance to the vehicle ahead. 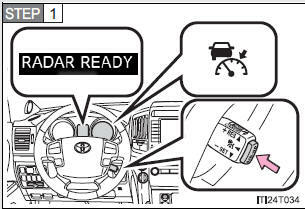 The windshield wipers are operating at high speed (when the wiper switch is set to the “AUTO” mode or high speed wiper operation position). When second start mode is set. The switching operation continues for 5 seconds or more after the center differential lock switch has been operated. Be aware of the set speed. 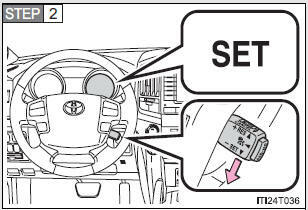 If automatic deceleration/acceleration is not appropriate, adjust the vehicle speed, as well as the distance between your vehicle and vehicles ahead by applying the brakes, etc. 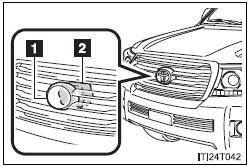 Assisting the driver to measure following distance The dynamic radar cruise control is only intended to help the driver in determining the following distance between the driver’s own vehicle and a designated vehicle traveling ahead. It is not a mechanism that allows careless or inattentive driving, and it is not a system that can assist the driver in low-visibility conditions. 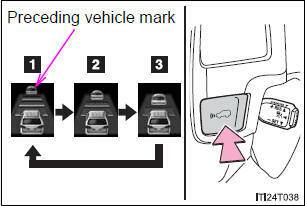 It is still necessary for driver to pay close attention to the vehicle’s surroundings. Assisting the driver to judge proper following distance The dynamic radar cruise control determines whether the following distance between the driver’s own vehicle and a designated vehicle traveling ahead is appropriate or not. It is not capable of making any other type of judgement. Therefore, it is absolutely necessary for the driver to remain vigilant and to determine whether or not there is a possibility of danger in any given situation.